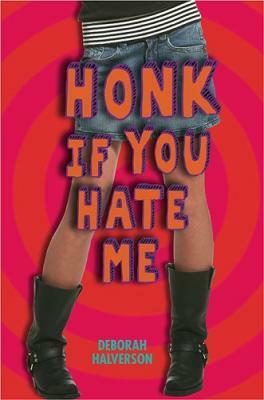 HONK IF YOU HATE ME released! <>I wondered if I’d experience the same sense of deja vu on this side of the desk. And I did . . . until I spotted Honk If You Hate Me on a Barnes & Noble shelf. I ended up just staring at the book for twenty minutes, mentally kicking myself for not having brought my camera to the store with me. I’d just finished signing fifteen copies of the book with a very special pen, given to me for this very special purpose. The bookstore staff had just congratulated me and said the most flattering things about the story, which they’d already read. I felt proud. And humbled. And amazed. And downright giggly. I couldn’t help myself, I just had to call my editor. My book was face out on the shelf, its hot pink and orange cover jumping out at a glance. Surely people walking through the door on the other side of the store could see it. Surely they’d come running over to hold it and then buy it and then read it. Surely. But wanting to be absolutely, totally postive that it was seen, I subtly drew passersby’s attention to it: “That’s my book! Right there, the pink one. I wrote that!” (Picture my wildly pointing finger.) And wouldn’t you know it, every one of my victims the intrigued browsers picked up the book and perused the jacket copy. How’s that for cover appeal? Now if only I could stand next to Honk in every bookstore in America, twenty-four hours a day…. I drove out to Borders last night. Imagine my dismay when they told me, yes, they could see that the book had ‘come out’ but no, they didn’t have it on the shelves. I asked why not and didn’t they know they were missing an opportunity to bring in lots of revenue, and that this book had been written by one of the wittiest, most creative, intelligent persons I know. I then special ordered your book. I’m thinking when I go to pick it up, I should special order another copy for their Manager. p.s. I want an autograph next time I see you. a copy. I am just getting ready to wind down and read your novel. I can’t wait!